Meg Ryan, during more facially-limber times. From time to time, when I attend a friend’s wedding, or catch reruns of romantic comedies starring a younger Meg Ryan, who still had control over her facial movements, I get the warm fuzzies and fantasize about what it’s like to have a relationship with a nice, normal guy. This propels me to socialize with men whom I would usually have no contact with, other than telling them while parked at a stoplight, that my windshields are very clean, and I don’t have any change, but thanks all the same. Another fallout of the warm fuzzies is online dating. Online dating is a voyeuristic way to meet people we may never want to come across in our normal daily lives. How else would we learn that Iluv69 doesn’t own a stitch of clothing for his upper body, because all of his photos show him naked from the waist up, wrestling with what looks like a Lochness Monster of a fish in Alaska, making a pie from a few twigs and some poisonous-looking berries in the Amazonian rainforest, or tending to malaria victims in sub-Saharan Africa? Most online profiles come across as too-good-to-be-true and exaggerations abound. The most common lies are about height, weight and age. A fifty-year-old man posts a picture of himself from ten years ago and wonders why the twenty-five-year old woman he met online, who is now sitting across from him, looks more like she’s forty five and requires reading glasses when perusing the menu. The Whole Enchilada: don’t forget to take your Beano. Many profiles have a similar structure: the first part is usually a personal introduction. Second section is about the type of person the profile author hopes to meet. It’s also a known fact that most people, regardless of their shortcomings, prefer to meet a partner who’s intelligent, attractive, humorous, and talented – The Whole Enchilada. As a result, the writer also tries to convey this in his/her writing, with varying degrees of success. Whether you’re new to online dating or are a seasoned pro, my next few posts will guide you along the slippery downward slope of online dating. 1. Determine whether the profile author is bipolar, manic-depressive, depressed, without the mania, manic, without the depression, OCD, or just plain stupid. 2. Wade through the boggy morass of men, who post pictures of themselves posing with yachts/sports cars/McMansions and find out if they are squatting in the mansions, have stolen the vehicles, or have suspended licenses due to a previous incident involving some pornographic movies and a goat. 3. Not be turned off by sixty-year-old men with online screen names, such as AVeryOralRoberts and ThePleasuredomeGnome. 1. Overcome your fears by initiating contact. 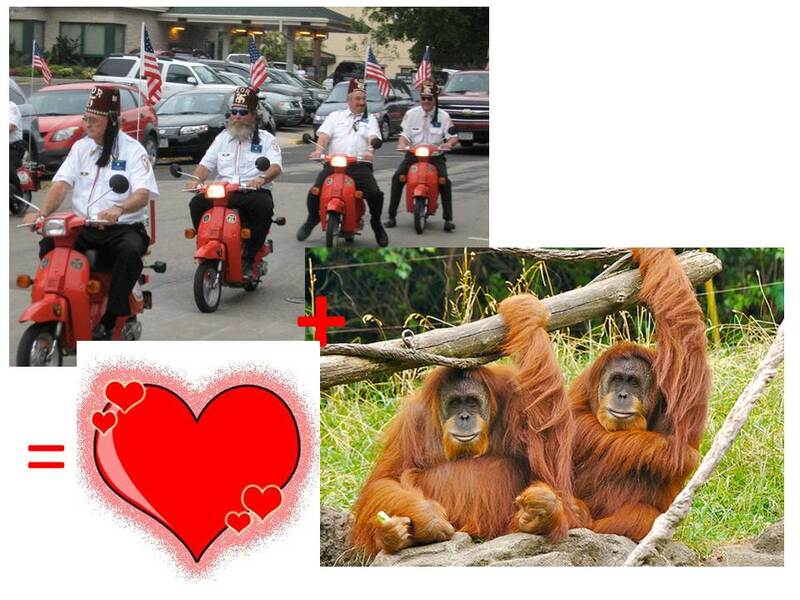 Independent, double-blind and double-blind date studies with a group of female orangutangs and a busload of Shriners on their way to the Vegas Strip irrefutably show that women who first make contact with men online will have as much success in landing the man of their dreams, as I will have in winning a game of golf against Tiger Woods with nothing but a walking stick and a jar of Vaseline. 2. Determine your deal breakers. This is something you will have hopefully figured out prior to going online, but meeting men online may trigger other deal breakers you may not have thought about previously. I’m not just talking about something so straightforward as, I will not date a man who talks incessantly about his love for pork, when you are a practicing vegetarian. I’m referring to those men who have watched Babe over thirty times and go through five boxes of Kleenex in the process. 3. Know when the FYI becomes TMI. Telling a potential beau that you have a two-year old daughter is fine. Telling him that you had originally thought she was just some bad Mexican food you had at a taco stand after a weekend drug binge in Tijuana is not. 1. Decide where to meet, what to wear, who should pay, and what self-defense weapons to leave at home. Where to meet? 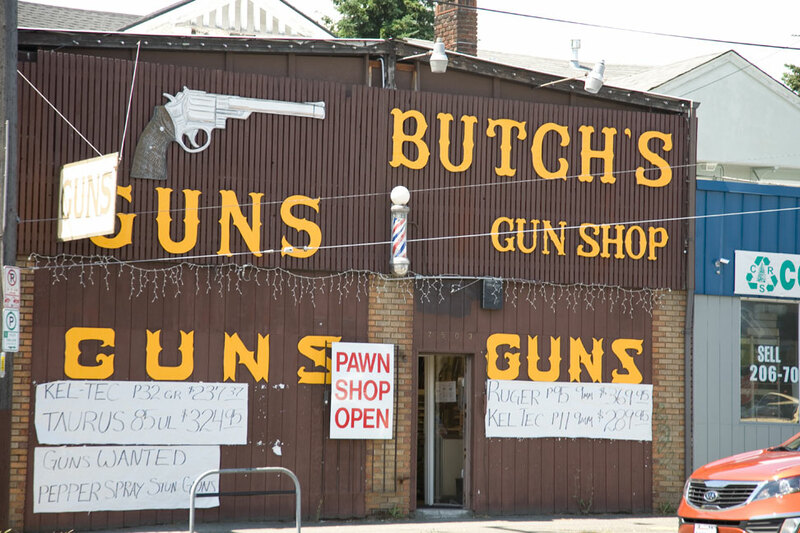 Butch’s Gun Shop. What to wear? Something conservative, but seductive, like anti-embolism stockings in a fishnet pattern. Who should pay? Hopefully, not his wife. What weapon to leave at home? Your hand gun. Butch’s has a wide selection of new and used hand guns at very reasonable prices and provides a free latte and wifi with every purchase. Yes, it exists! The next great date hotspot. a/ How long has he been out of/how long will it take him to get to prison. b/ Where the hell is that pervasive garbage smell coming from. c/ How many Arbys are there within a five-mile radius of his house. a/ Starts sobbing uncontrollably on your shoulder, because you actually showed up and are really a woman. b/ Keeps calling you, Mamma (fill in your name here). c/ Frequently checks under the table to see (i) if you have a prosthetic leg; (ii) if your conversation’s being bugged; or, (iii) if you have kept your pants on (because he hasn’t). 1. How long should the initial date be? Answer: As long as you can stand it, without suffering irreversible brain damage. Usually between ten and thirty seconds. 2. Should I sleep with him on the first date? Answer: Only if you haven’t fallen asleep already. 3. My date’s embarrassing me by laughing like a hyena, talking loudly about his past sexual conquests, and asking me for my measurements. What should I do? Answer: You have that stun gun in your purse – one of my “Ten Essentials for your First Sarcastic Date”. If you don’t have that, the chair you’re sitting on will work just as well. 4. Why is it that every guy I meet falls short of his great online profile? What can I do about this? Answer: Dunno the answer to that one, but you can write a sarcastic blog about online dating. “Online dating is a voyeuristic way to meet people we may never want to come across in our normal daily lives. ” Three years and around 30 first dates and online dating has led me to many people I would not want to come across in my normal life!! I can’t count how many times I’ve returned from a date and asked myself – am I the only normal person left on this planet?! Nice to know I’m not the only one who feels that way. Looking at too many online dating profiles gives you the added benefit of becoming cross-eyed, so subsequent profiles don’t seem so bad. Every once in a great while, the single life can seem somewhat appealing to a married person. I may print out this post and tape it to the wall next to my desk, in anticipation of just such moments. Great work, as always, Susan. If my sarcastic dating life keeps just one married person from flinging himself/herself into the brick wall of online dating, then it would be all worthwhile. Thanks for stopping by, Charles. Hey! Enjoying your blog and linked you on my latest post if you’d like to check it out. Thanks, JBo. You’re pretty hilarious too. I’m now following. How ironic, but your comment WAS moved to Spam, and I’ve just found it…ah, gotta love Akismet. Interesting take on online dating from a guy’s point of view. 95%+ of my regular readers are women (except for one lone male soul who everyone suspects might be a woman. I think it’s because he’s a good-natured Brit). So, my posts will tend towards male BASHING rather than WORSHIP. Well it caught my attention and it kept my attention the whole way through. I appreciate you taking time to visit my post as well. Most of us deserve a good “BASHING” for sure. Hahaha! Really makes you long for the days of plain and simple mail order brides. To be fair, I don’t think any guy can live up to our expectations based on his profile because there are always blanks we have to fill in, and we will always fill them in optimistically (overly so). It’s hard not to be more critical than you would be of a guy you met in the context of your everyday life (in my experience anyway!). You do have a point there. Aim for the best, but prepare for the worst, eh? Yep, or maybe have your friends pick out dates for you so that you arrive completely free of expectations! AVeryOralRoberts? Oh, ewww. That’s hilarious. I did a blog entry on job interviews in a similar vein. Come to think of it, interviewing for a job and dating are pretty similar. Both are frustrating, scary, and usually you end up with nothing but wasted time. Great post. Ah! Hilarious and terrifying. Man shopping- greaaaat. Other people have the fantasy about nice normal guys too? Awesome post! ha! Well, I guess just you and me fantasize about normal men, Lauren. Thanks for stopping by! Brilliant – we are not really like that are we? Errr…perhaps you should save your question till next week, when I post an actual online profile from someone who describes himself as a man. Agreed. I can’t even begin to choose which part was my favorite. Thanks, Edna! Are you still recovering from the Olympics? Haha yes, I’m gearing up for the next event now! Your posts just get better and better. Thanks, Heather! Boy, you do get up early (must be the young’uns). 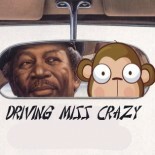 This entry was posted on August 28, 2012 by lostnchina in Dating, Humor and tagged meg ryan, online dating, online dating profiles, personal ad, single woman. C'mon...follow this blog...it's not gonna hurt, honest. Me, Twitter – Who Woulda Thunk? 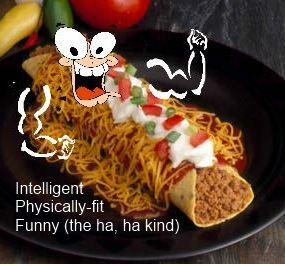 For more Asian hilarity at half the calories, LIKE LOSTNCHINA on Facebook! If anyone is sick enough to want to regurgitate any part of this blog and call it his or her own, please (kindly) note that all the stuff on here, unless otherwise noted, belong to Lostnchina, aka Boozy Suzy, Suppository Sue, Big Mamma Chang, or Chop Suey on the weekends.